Killer whale Kasatka swims with a calf in 2004 at SeaWorld in San Diego. SeaWorld and animal welfare advocates are mourning the passing of one of the park's oldest killer whales. Kasatka was euthanized at SeaWorld San Diego on Tuesday evening after suffering from a respiratory infection. Kasatka was a matriarch of the orca pod in San Diego. She had been captured in the wild off the coast of Iceland in 1978. 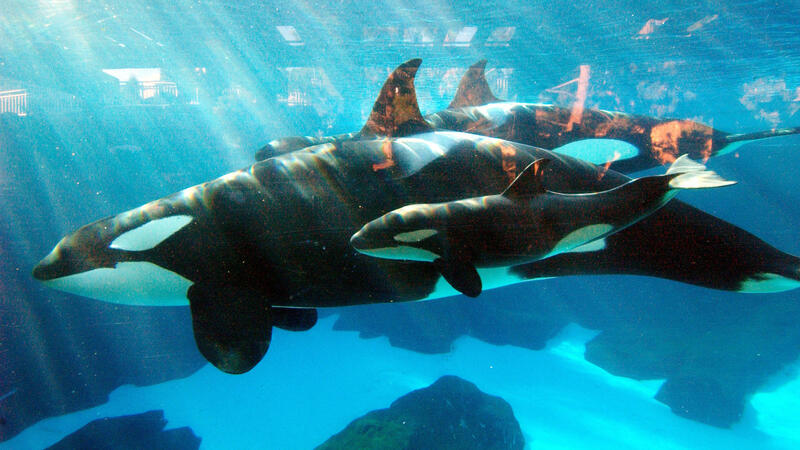 SeaWorld says she had four calves, six grandchildren and two great-grandchildren. Kasatka was believed to be 42 years old. Orcas typically live to at least 50 in the wild. For the last several years, veterinarians at SeaWorld had been treating Kasatka's respiratory infection with a specially designed inhaler. In a statement on its website, SeaWorld wrote, "as her immune system aged, it became more difficult for her to fend off the illness and her medication took longer to have an effect." In recent months, animal welfare groups posted photos of Kasatka on social media showing her with prominent skin lesions, which they attributed to a fungal infection. SeaWorld says the respiratory condition the whale had is the most common cause of mortality for whales and dolphins in captivity and the wild. Last month, a 3-month-old killer whale, Kyara died at SeaWorld San Antonio from pneumonia. Kasatka's death is the latest setback for SeaWorld. Since the release of Blackfish, a documentary that examined the 2010 death of trainer Dawn Brancheau, after she was dragged into the pool by a male orca, Tilikum. The company's public image has suffered and attendance at its parks has declined. SeaWorld posted a nearly $176 million loss in the latest quarter. Its stock has fallen by nearly a third since the beginning of the year. To help counter public concerns, SeaWorld announced last year that it was ending its captive breeding program and would phase out its theatrical orca shows. SeaWorld says it has 21 orcas left in the U.S. plus several on loan to a theme park in Spain. With Kasatka's death, animal welfare groups are renewing their calls for the company to move its remaining killer whales to enclosed coastal sanctuaries.